Dark comes early since we pushed back the tiny hands of time. One hour makes a difference. The other evening in the early dark, I drove home on rain-lacquered roads. In town, going through a line of traffic signals, the road was a lake of clear water; the red, green, and white lights the fish shimmering and swimming across it. I thought of my father because rain and I share childhood memories. When I was growing up, my family went for a ride on rainy nights. Daddy drove and mother sat close beside him. 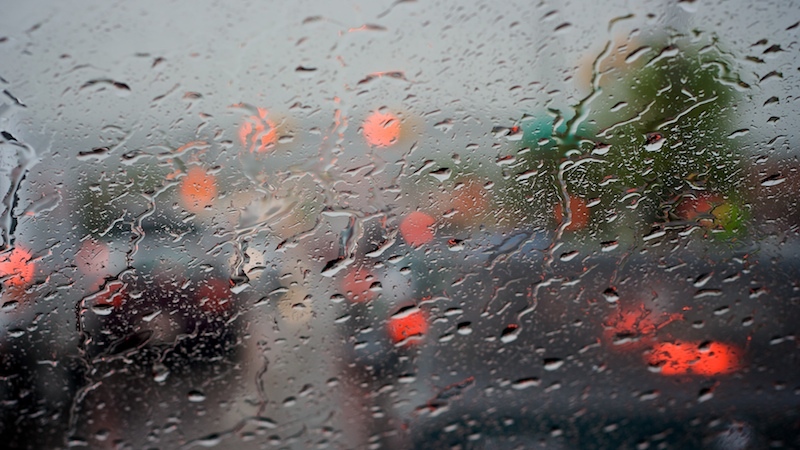 My sister and I sat in the backseat in a cocoon of sounds: the steady swish of wipers trying to keep up with the rain, the shushing sound of tires on the wet roads, and the clicking of our turn signal winking at the other cars to let them know we were turning. As a family, we watched the rain transform the known world, first with a bright shine, then with a glaze of gray, but always with beauty. In the car, we marveled at the gallery of sights. There was no time or need to tell each other everything we saw in that kaleidoscope of color and shadow – things moved by too quickly. Above the rain’s murmuring, soft but clear, we heard our parents’ voices. They told stories about us, our relatives, and their own lives. My sister and I listened, awash in the intimacy the rain brought. We learned that our Aunt Ann had been not only a psychiatrist but also a pilot. The rain matched the faint echo of crying we could hear in those stories about her. Much later we learned she had committed suicide. They laughed and whispered too. Mother snuggling closer, daddy putting his arm around her. The two of us in the back, following as they took us farther down the road. My sister and I didn’t realize it at the time that we had already begun our own journeys, away from childhood, away from our parents. But on those rainy nights in the car, we were together going in the same direction. Soon the talk, the dark, and the hum of wheels would lull us to sleep, and my sister and I would lean against our separate doors to dream of catching the brightly colored fish that swam across the rain spattered streets. Later we would awake to the place of our belonging because, as sure as rain, the road always led us home. Thanks for this! Similar memories of backseats on drives in the dark or the dim. My parents spelling each other on a non-stop 24-hour drive to Florida, the kids in their own room in the back created by putting a crib mattress across the seat, the suitcases stashed in the footwells. Stars in the back window, parents’ low voices in the front, the hum of the tires under us, safety and intimacy all around this tiny home moving through space. Years later, there was actually a Peanuts strip about this same kind of moment; and if you read “Sonny’s Blues” by James Baldwin you’ll find a description of family gatherings in Sunday afternoon parlors evocative of that sense of protection and warmth. That last one, in particular, always grabs my heart. This brought back memories of Sunday rides we took. It was always lovely. Thanks for jogging my memory. We always looked forward to taking a drive, but I think I remember the rainy night drives the best. What a lovely post…such nice memories. We didn’t do anything like that, but I have a fondness in my heart for rainy drives, just the same. The world is transformed into that kaleidoscope that you talked of and I love the sound of tires on wet pavement. Unfortunately, my astigmatism is causing more and more havoc on my night vision, especially in the rain. It’s such a disappointment to me to be worried and tense instead of delighted when I’m out and about on a rainy night. I much prefer to be the passenger than the driver on a rainy night. Like you, my night vision is not what it used to be, and I think I’ve become the little old lady driving slowly in the fast lane with her blinker on. This piece is gorgeous. You have *such* a talent for the visceral.